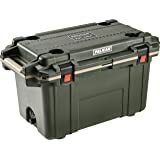 MADE IN USA: Includes Pelican's legendary lifetime - "you break it, we replace it. Forever! " From camping trips in the woods and days on the water to backyard barbecues, the Pelican Elite 50 Qt. 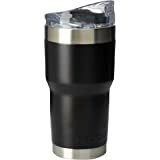 Cooler is perfect for holding food, drinks, or whatever you want kept safe and cold on your adventure. It brings you all the same DNA that Pelican Products brand has used to protect defense, emergency, and scientific expedition equipment since 1976, so you know it can be relied upon for a lifetime of use. 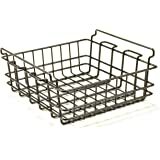 The polypropylene body provides a tough exterior, while the molded-in handle system with ergonomic styling makes hauling and moving the cooler a breeze. Integrated fish ruler on top of lid. 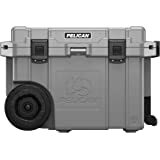 With 2.0" (5.1cm) of polyurethane foam, a freezer-grade seal, and dual ABS plastic press-and-pull latches, the Pelican Elite 50 cooler offers extreme ice retention. Built-in stainless steel lock hasp between the latches lets you lock the cooler tight for extra security, while conveniently serving a dual-purpose as a bottle opener. On the cooler lid's top surface, molded-in can holders provide a spot to set your drinks whenever you need to step away or use both hands. 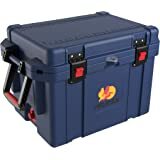 So, you can you can keep your drink cold, crack it open, and safely set it down all in one place: the Pelican Elite 50 Qt. Cooler. 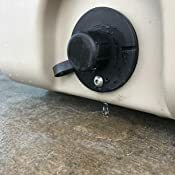 When it's time to clean up, the sloped floor and tethered drain plug drain the cooler with ease, and the opening is threaded to fit a standard garden hose for cleaning. From top-to-bottom and inside-out, Pelican Elite Coolers are built for next-level performance throughout a lifetime of adventures. 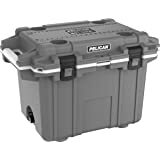 That's the confidence of the Lifetime Guarantee Pelican holds behind their design. Made in USA. 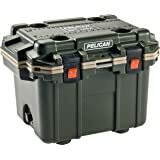 I have used other Pelican products from family members and loved how great they were. 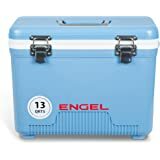 I decided to invest in a cooler also. 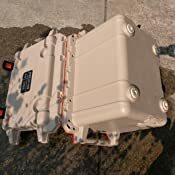 I purchased the Pelican Elite 50 quart cooler and the first time using it it leaked like a sieve. My entire trunk was soaked. Pelican customer service was not helpful. A defective product from the start and they are expecting the customer to pay for all the costs of shipping across the country both ways and fixing. When you spend over $300 on a product you expect it to work and the company to stand behind it. Unfortunately neither happened. 5.0 out of 5 starsMy new fav! Amazing cooler. Took with me on my first camping/shooting trip. Tuesday I tossed a bag of ice, 20lbs in the cooler, nothing else. Opened on Friday morning to find the ice was still 2/3 frozen with some water. Tossed in my food items and another bag of ice, 20lbs. Headed into the hills Friday night. When I was home Sunday evening, I had well over a 20lb bag of ice with some still in the original bag. All food and drinks were cold. This thing works great! Initially thought the hype was warranted. But no. This cooler is a joke. I'm hoping this was a defective model. But the first day used it, it was a let down. The drain plug leaked like no tomorrow. I thought it wasn't tightened down all the way. It was, but the screw wasn't. So we tightened it down with no luck, it was coming from the actual hole and the plate wasn't sealing. 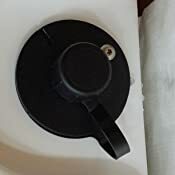 On top of that the lid gasket doesn't go the full perimeter of the lid nor does it seal tight and if it gets tilted while lifted water rushes out the top. Overall complete waste, especially when I was hoping to get the same quality in their hardcases that we use daily. Due to the water leaks, ice retention was a joke. Had to add a 20lb bag of ice every 48hrs because of that. 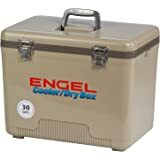 This was a really good cooler, for the 1st few months then it would not hold ice, got the major run around from the Pelican warranty department. Now it sits next to my other cooler which works awesome. I'm still holding very slim hope that Pelican will honor the warranty. We'll see. Opened it up, read everything, then filled it with water because I read that some people have trouble with leaking. Of course, it started leaking as soon as the water was above the drain hole. 5.0 out of 5 starsAwesome Cooler! 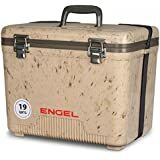 Based on all reviews and videos out there it seems like all rotomolded coolers are far superior to your "standard" cooler as far as ice retention and food safety. That was especially important to us since we like to do a lot of camping. 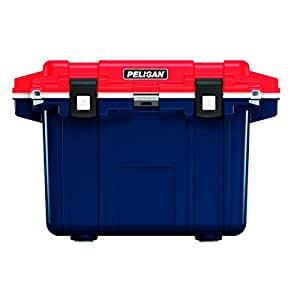 Initially I was going to buy a different brand cooler but since I decided to buy right before a labor day camping trip, I could not get it in time so I switched my choice to the Pelican cool that I could get in time. I'm glad I did. Both coolers seemed to have the same ice retention so I didn't think it was a big deal. What I do love about this cooler is the latches. They are much easier to use than the rubber tie down style that most other coolers tend to use. I also love the fixed handles. It's much easier to carry than a cooler that hangs from strap type handles or one that has swinging handles. The downside to that is it makes the overall size of the cooler much larger. That can be a problem when loading your truck with square bins as it leaves dead space under the handles. If you're good a packing you can always stuff some small stuff in between. As far as performance, we left Friday morning with the cooler full or water, beer and food with three 4 pound blocks of ice. (all contents were cold when the cooler was packed). We consumed almost everything in the cooler during our trip and returned home late Monday night with 3 small chunks of ice left. We never had to add ice like use usually do with our standard cooler and everything inside stayed cold, even the items at the very top of the cooler. I was always concerned that the items on top were not staying cold in our old cooler since most do not an insulated lid. No concerns with the Pelican. This is our Second Pelican Cooler and We are Sold....Much better Ice retention in over 100 heat than a Yeti. 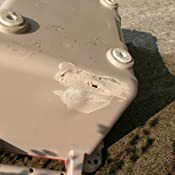 Its Built very very well....BUT....we took a long trip with two pelicans and a camp box on a curt trailer hitch cargo rack.....after a 700 mile day over the Rockies we found that the cooler got melted from the exhaust 18 inches away from the cooler....kind of blew my mind. it melted through to the core. it maintained ice but its a matter of time before it is through the insulation. LOVE THIS THING! Had it in the sun on the boat for 5 days in 100+ Arizona heat and my ice lasted the whole time! Even had to thaw out some meat to BBQ on day 3! Worth every penny!